Last Sunday I decided to go to Disneyland. I hadn’t been to the parks since before Labor Day (pre-Disneyland Half Marathon Weekend) and I was beginning to suffer from withdrawal. I was hoping that September meant I could wear some jeans, but unfortunately the forecasted high for Anaheim that day was 104 deg! It was going to be the hottest day we’d had all year (after our mostly mild summer). Since long pants were out of the question I pulled out a pair of shorts that I bought earlier this year instead. But when I went to put them on I was thrilled to discover that they are way too big! 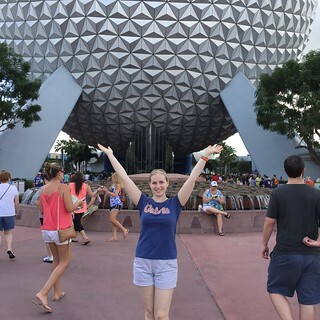 I had to dig deeper in the drawer for a pair of shorts from last year (pictured in the above photo at EPCOT last November), and even those were a little baggy. That was an amazing feeling. I knew I’d definitely been more comfortable in some of my old clothes recently, but the shorts were a surprise. I didn’t realize I’d changed that much already. On Labor Day I started Nutrisystem. In spite of lots of exercise (obviously a lot of running and, more recently, the addition of weight training) and what I thought was a relatively healthy diet (except for my soda addiction) I hadn’t had any luck dropping the weight I gained last year when I hurt my knee. My body was just clinging to the extra pounds and none of the small changes I’d tried seemed to make any difference. I knew I had to do something drastic to jump start the weight loss process. So one day I took the plunge and place my first Nutrisystem order. I really had no idea what I was doing, but I crossed my fingers and hoped for the best. I started the meal plan the day after the Disneyland Half Marathon and started getting results immediately. I won’t lie, I was hungry ALL THE TIME, but I lost a pound a day during that first week. It was like a miracle. The weight loss has slowed a bit since then, but I’m keeping at it. Based on how much I exercise I eat a little more than the system allows, but I think it’s necessary. The other day I realized that some of the new pants I ordered from Old Navy recently (during a 50% off Labor Day sale online) were feeling loose. Not like I’ve lost a full pants size yet, but I might be getting there. Will I be disappointed if all of my brand new pants don’t fit in a month? A little, but I’ll be much happier being smaller and lighter than I’ve been in about a year and a half. And running will be easier too. We’ll see how it goes!